Orbicular granite – a rare and distinctive rock containing minerals arranged in spheres (or orbs) – is found in the Karamea area. Highly prized by collectors, it has so far only been found as scattered boulders. 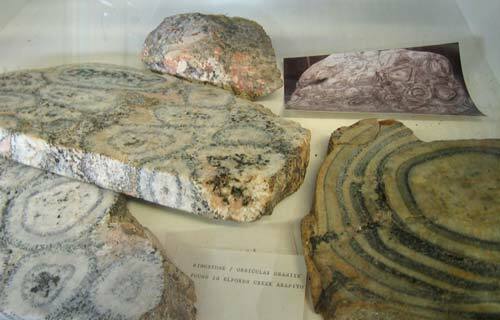 These slabs are from the Karamea Museum, where two different types of the rock are on display. Geologist Patrick Marshall purchased several boulders in the 1930s and 1940s, and arranged for them to be cut into slabs and polished. He sent these slabs to museums throughout New Zealand, as well as museums in Australia and the United Kingdom. Every year members of the Sedgwick Club at Cambridge University, England, pose for a photograph with a slab of orbicular granite from Karamea.